Happy Friday! Hope you have a fantastic weekend lined up - perhaps some Mother's Day festivities! This past week a bright and fabulous Fresh Flowers (which is on sale through this Sunday) card knocked our socks off in the gallery at SCS - you can see it here. That card lead us to this week's Our Friday Friend Julia Aston (artystamper on SCS). Julia created yet another wonderful card to share with you here today - this time featuring A Year of Sweets 2. We asked Julia a few questions so we could all get to know her a bit better. --What city/state do you live in? My father was an artist and my mother was an elementary school teacher so we were always doing arts and crafts in our house. I've been stamping on and off since I was little. I started with those fun holiday stamps teachers have like the busts of Lincoln and Washington. And I also used to play library using the date stamps! I've been seriously artfully stamping for about 5 years. I stamp rather simply - with clean lines and not many accessories. It took me a long time just to add more layers! LOL! I'm starting to be more comfortable using ribbons and buttons as you can see by my card here today! I really love paper crafts - particularly boxes, bags and little houses - I have a box full of templates and patterns that I've found while blogging! Now I just need to find the time to make everything I'm excited about! I think it's a tie between the fun window in the Fresh Flowers set and the cute street of shops in the Downtown Diva set - although the little nurse and sick in bed cuppies in the newly released set are awful fun too!! Unfortunately for my waistline, I love all kinds of sweets! but if I had to choose one - I guess it would be a simple soft fudgy brownie - possibly with vanilla ice cream and hot fudge sauce on it! 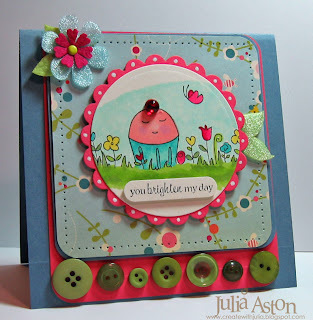 You'll want to be sure to stop by Julia's blog Create with Me to learn more about today's card and see lots more of her creations! Thank You Julia for being Our Friday Friend! And how about you - would you like to be Our Friday Friend? **Create something (card, 3D item, scrapbook page, anything) using one or more images from any SASI or Whimsical Wishes stamp set. Your creation should showcase SASI or WW, but does not have to be exclusive to SASI. **Upload your creation to SCS being sure to use the keyword SASI or tayloredexpressions (no space) so it will appear in the Taylored Expressions Company Gallery (which is driven by a keyword search) and complete the recipe section of the upload. Thanks so much for checking in with us today. We hope you've got us in your subscriptions. If you've missed any of the posts this week please be sure to scroll down. The Baker's Dozen girls have some wonderful things to share! And don't forget that the TE Store will have new offerings in the What's the Deal department every week in May. We are currently featuring Flowers for Mom with lots of flower related products at 15%. Be sure to check again Monday to see what next week's sale will be. Thanks for this super honor - having my card here today! I love all the crafts posted here by the DT ladies! Especially the little house by Jen del Muro! and what a delish card it is, Julia! love the mis-matched buttons and that yummy DP! Great pick for the Friday friend, Taylor. Oh!! Great choice! Congrats Julia -you know I am a big fan. This card is super cute. Love all the buttons and the piercing. Perfect!! Whoohoo!!! Congrats, Julia...what an honor!!! I love your sweet card with the darling little cuppie, cute buttons, and awesome colors!!!! Congrats Julia! You KNOW I love ya and your work! GREAT card....it's adorable! Congrats, Julia! Thank you for sharing your beautiful card. Loved getting to know you better! Mz Julia!! HUGE CONGRATS, girl! Wow, how exciting to see you as the Friday Friend. AWESOME sample card...soooooo cute! !